With MIDI protocols, you are ready to go in most situations but we couldn’t resist incorporating direct and seamless connections between SEQ and voltage control universes, which we are quite fond of. Out of this urge of ours, POLY was born. 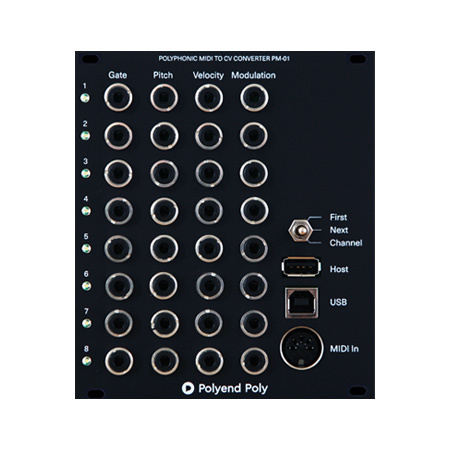 A Eurorack module with implemented configuration reflecting SEQ’s eight channels. It converts the MIDI signal to voltage values managing the Gate, Pitch, Velocity, and Modulation parameters of each step. Through CV outputs, any Eurorack array can be fed with all the musical content you just created using SEQ.